QUEBEC CITY (CelebrityAccess MediaWire) — Roger Waters is set for his Saturday performance of The Wall in Quebec, a show that will feature the largest actual wall ever constructed for a live performance of the seminal Pink Floyd album. 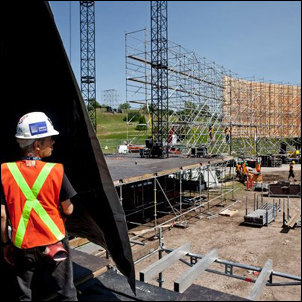 The Wall in question has more than doubled in size from previous shows to a massive 250 metres, with a full surround sound system for the entire site. The show will also feature additional lighting and pyrotechnics as well as other "surprises" according to a press release. Water's tour had originally been set to end on July 14 in Philadelphia, but Waters was intrigued by the idea of a final, supersized outdoor performance. "He agreed that this show would be the perfect crescendo for his North American tour," says Daniel Gélinas, General Manager of 3E. "It’s the ultimate finale to this incredibly successful outing!" The tour will now officially end in Québec City, but on a unique scale and proportion set to amaze fans. "The occasion was ideal. The site was ideal. The idea seemed too good to be true, but it’s finally happening! This will be an event that some of us – those lucky enough to attend – will be proud to say, ‘I was there’. This is one night we are sure to always remember," adds co-promoter Serge Grimaux. By any account, Water's tour has been a success, playing 160 shows in 27, including a 9-night stand in Buenos Aires, breaking the previous record of 5 nights, which the Stones set on their "A Bigger Bang Tour."